Trainer David Atkins has designs on the Golden Rose for promising three-year-old Jonker if he proves he’s among the better colts in Saturday’s Group 3 $150,000 Singapore Airlines San Domenico Stakes (1100m) at Rosehill. 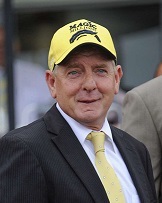 Trainer David Atkins (Pic: Bradley Photos). Prior to Christmas, Jonker was the boom youngster on the scene following dominant wins on debut at Newcastle and in the Wyong Magic Millions. Atkins said the horse has recovered well after being knocked down in the Gold Coast Magic Millions and is looking forward to getting a guide on his spring prospects. “If he can aim up against them we will press on to the Golden Rose,’’ Atkins said. “Bar the Magic Millions, you have to forget that one, this is the hardest field he’s been up against. Jonker suffered some cuts to his legs and some bruising when he was almost put over the inside fence in the early stages of the Magic Millions and he eventually ran last. Atkins said the injuries weren’t serious and he was never going to be continuing through the autumn. “He was always an immature horse and when he came back from the Gold Coast I said to the boys we’ll give him three months off and let him grow and fill out,’’ he said. Jonker opened $8 in TAB’s San Domenico Stakes market behind Performer ($3.60) and Plague Stone ($4.40) and he’s a $26 chance in Golden Rose betting. The colt has had the benefit of an 800m trial at Gosford where he held off unbeaten San Domenico rival Graff and Atkins said he’s ready to race. “He certainly could have led the trial if he wanted to, he has a lot of natural speed, but I was happy with him there,’’ he said. “He quickened up nicely and pushed him out hands and heels a bit. “Horses like Impaler and Moss Rocket were brilliant track workers but this fellow’s not a brilliant track worker, he’s a different horse when he steps out of the barriers. As for the prospect of a rain-affected track, Atkins said aside from striking a soft 5 in his first trial, which he won by almost 10 lengths, he hasn’t been exposed to anything other than good ground. Godolphin trainer James Cummings believes Plague Stone has had a much better preparation for the San Domenico than leading into the Rosebud, where jockey Hugh Bowman reported he refused to settle and could only manage fourth behind Sandbar. Despite that the colt still managed to run the third fastest last 600m of the race in 34.68 (Punters Intel). With Bowman riding Performer, Glyn Schofield takes over on Plague Stone on Saturday. “He looks like he’s using himself more sensibly and he let down really powerfully in his work this week,’’ Cummings said.